We thought Madonna was pushing things a little as a 47 year old when she released ‘Confessions On A Dancefloor’ in late 2005. But she did so with the help of producer Stuart Price and produced a pOp gem that sampled Abba and topped club charts the world over. It did, however, contain it’s fair share of dodgy lyrics. Our number four album also contains a couple of lyrical mis-steps, but all in all shines purely because of the woman behind it’s creative genius. She’s so unusual – there ain’t many artists in the world that at age 54 would dare to release a dance album, but heck, that’s what US singer Cyndi Lauper did in May this year and she did so with some of the biggest names in dance/pOp backing her every step of the way. With a who’s who of producers on board for the project, including Dragonette, Scumfrog, Axwell, Richard Morel and Basement Jaxx, ‘Bring Ya To The Brink’ was always going to be something special – and it delivered. It bustled from start to finish with the latest sounds, beats and savvy club vocals. It was the kind of album Robyn should be hard at work making, the kind of club record that many young pretenders would kill to have created and a disc that garnered a Grammy Nomination for the Best Electronic/Dance Album. And while some find Cyndi’s vocals polarising, on this album, they never grate and don’t take away from the extraordinary production values. ‘Into The Nightlife’ was so ‘now’ in it’s sound, radio programmers didn’t know what to do with it, ‘Same Ol’ Story’ was sent to radio in six minute version, hence it was never played and the Kleerup-produced ‘Lay Me Down’ was ‘With Every Heartbeat’ part two. ‘Bring Ya To The Brink’ deserves the Grammy – for it just goes to show that someone who many believe to be a ‘has been’ really ought to be classed as a ‘could be again’. 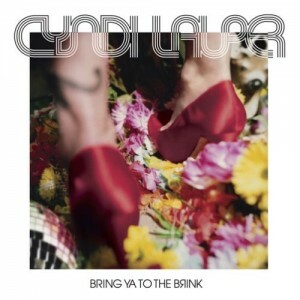 She may be unusual, but Cyndi Lauper is not afraid to experiment with her sound and on ‘Bring Ya To The Brink’, she triumphs wonderfully. New CD containing remixes of the songs from Into The Nightlife is to be released in Japan on 18th February, 2009. It is called FLOOR REMIXES. It contains 10 tracks. There is also a limited edition version that contains a DVD with three videos. SonyBMG Australia – please give this a local release!!! Totally agree with your comments….Bring Ya To The Brink is a fantastic album-I love every single song on it!This album deserves all of the critical acclaim it has received around the world and hopefully more and more people around the world will discover it over time!A much deserved grammy win should help! For anyone who hasn’t given this CD a try is missing out! It’s fantastic! I sure hope she gets that Grammy. She deserves it hands down!! Gotta admit, I am a die hard Kylie fan, but am fully behind a Grammy win in this cartegory for Cyndi. Easily one of my favourite albums of the year. Good Luck Cyndi!! I agree – This was quite a decent album! If you haven’t checked out this CD yet, now is the time. It deserves all of the praise that auspOp lavished on it. Cyndi is at her brilliant best!! !